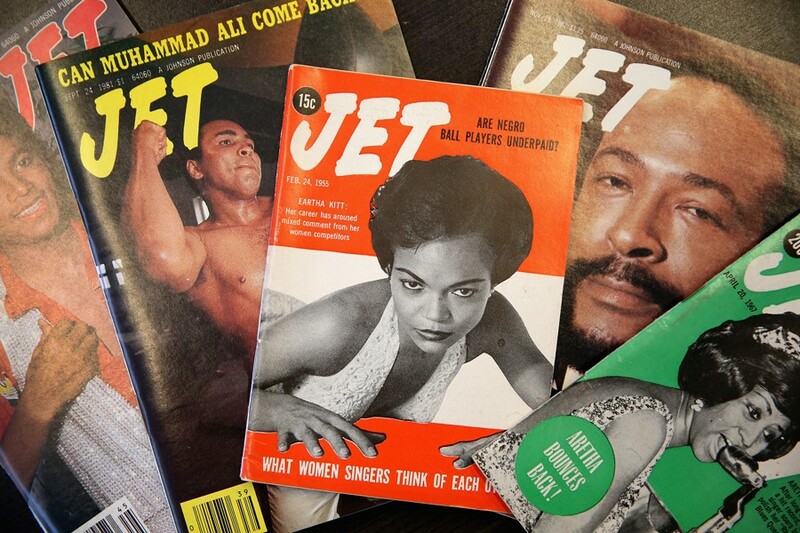 Vintage copies of JET magazine are displayed in the offices of Johnson Publishing Company on June 9, 2014 in Chicago, Illinois. Born in Arkansas in 1918, John H. Johnson relocated to Chicago with his mother, Gertrude, to further his education after his father, Leroy, was killed in a sawmill accident when Johnson was just six years old. After graduating from DuSable High School and the University of Chicago in 1942, Johnson took out a $500 loan using his mother’s furniture as collateral to open the doors of Johnson Publishing Company. Launched in 1945, Ebony revolutionized the way black journalists and advertisers engaged with black readers. Six years later, Johnson published the first issue of Jet, a weekly periodical that offered an alternative to mainstream coverage of social issues affecting the black community. While Johnson is identified as the visionary behind the publishing company, the structure of his business has always been heavily centered around his family. Through the years, Johnson’s wife, Eunice, co-created ventures such as Ebony Fashion Fair. His daughter, Linda, excelled in the roles of president and chief executive officer, while his son, John H. Johnson Jr., was a talented staff photographer for Ebony and Jet prior to his untimely passing at age 25. This family-centric business model has seen the company though nearly a quarter of a century. In this photo slideshow, we reflect on the legacy of John H. Johnson, while also taking a look back at the contributions made by other members of the Johnson family to their namesake publishing company. The new Cultural Center exhibit shows how much design innovation came from black artists in Chicago. A multimedia story inspired by the former Illinois poet laureate's 1968 poem In the Mecca.